This update will overwrite your old 7/14 form so that any existing form packs will be automatically updated. It will also add a copy of the old 7/14 forms to the NC Contracts folder, so if you want or need to use up old stock, you will have to manually select the 7/14 form when printing. If you do not want to do that, we do not suggest getting this update yet! **NOTE** We have not yet received a copy of the 10/17 ARB form, so if you need that version and would like to donate one to be programmed, please contact us at support@kgisolutions.com! 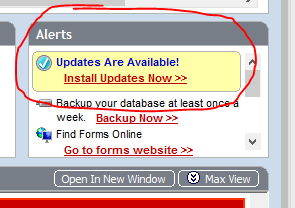 To update your plain paper forms, please use the "Check For Updates" feature built in to Dealer Solutions. This is visible on the home screen to the far right, and will be yellow if updates are available. If you use the LAW 553 as your installment contract for BHPH deals and want to start charging a $15 late fee, you will need to do something special for the new deals and you must not change the defaults in settings! Click here for a full article on it. If you do NOT use the LAW 553, an update to the KGI BHPH Contract will be up soon with the $15 fee, but no other contracts will be updated. If your contract says 5% or $6 on the front and does not mention that the law may change, then you must continue charging only what is on the contract.